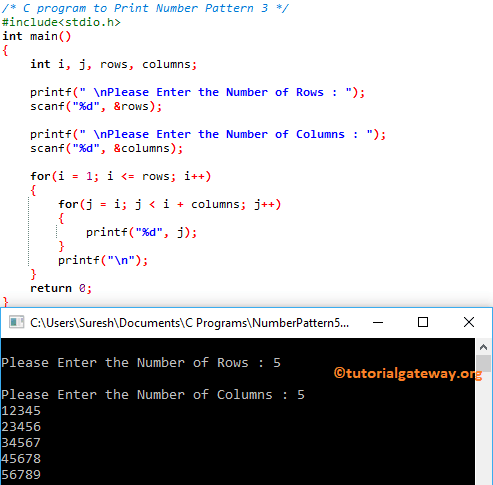 In this article we will show you, How to write a C program to Print Number Pattern 3 with example. For this, we are going to use For Loop and While Loop. This program allows the user to enter the maximum number of rows and columns he/she want to print as a rectangle. Next, compiler will print the numbers pattern. The j value is 1 and the condition (1 <= 6) is True. So, it will start executing the statements inside the loop. Next, we used the Increment Operator j++ to increment the J value by 1. This will happen until the condition inside the inner for loop fails. Next, iteration will start from beginning until both the Inner Loop and Outer loop conditions fails. In this program we just replaced the For Loop with the While Loop. I suggest you to refer While Loop article to understand the logic.